Sometimes we use this stuff called IRM, that stands for Intermediate Restorative Material. It was developed as a temporary filling material; used to buy time till the patient could have a proper, more permanent restoration. Of course, there really is no restoration that is truly permanent. A variation of this material is simply called Zinc Oxide and Eugenol or "ZOE". The stuff consists of a powder of Zinc Oxide and a liquid Eugenol which is basically oil of cloves. Yes, it smells like cloves. The clove oil sort of numbs the tooth (thus a sedative effect). IRM is the same as ZOE but has a reinforcing material added to make it more resistant to wear. If you have a rather large cavity, you can remove the bulk of the decay and place an "IRM" filling, also known as a sedative filling. 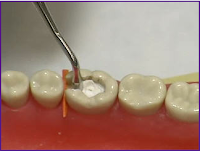 This will often slow or stop the progression of decay and help the patient feel better. It also may allow the tooth time to recover and lay down secondary dentin (sort of a second layer of scar tissue), sometimes eliminating the need for pulpal treatment like a root canal. Once the tooth is recovered and less inflamed, any remaining decay is removed and the final restoration (filling or crown) is placed. You mix the powder and the liquid together to make a kind of play dough material which is placed in the tooth. It hardens up in a few minutes. It usually lasts a pretty long time, but still will eventually wash out due to the biting forces and wear. I have seen them last anywhere from a month to more than a year. 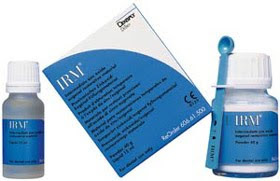 In pediatric dentistry we use IRM it for temporary sedative fillings and to seal pulpotomies. ZOE can be used too seal pulpotomies and baby tooth root canals. You can actually buy a variation of this stuff in your local CVS or drug store. It often comes under the name, "Dent-Temp". Nic e post! Your blog seems to provide valuable tips for the dental community. 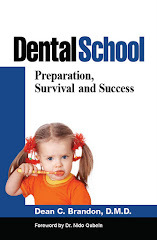 I think I should refer a dental webinar here that would be useful for the dental community. It’s titled “Veneers: What is New and Possible” and will take place on February 18, 2010 from 7-8 PM EST / 4-5 PM PST. It is going to be presented by Dr. Helaine Smith, DMD, an expert in full mouth reconstruction. The webinar info can be found on: http://www.e-dds.com/improving-your-cosmetic-dentistry.asp and registration link is: http://www.e-dds.com/form.asp. Hope this is useful to all. Good info. Some times you forget about the simple things that can make the job easier. my 7 year old daughter got a root canal in her lower right first molar a year back after going through boils/infection in her mouth,after exactly a year she started having boils in the left lower first molar and again had to go through the process of root canal.and now again after just a month of root canal she is having boils in gums under both the root canal tooth. my question is when the root canal is done and filled with IRM (thats wat they said they r filling it with)how can this infection comes back? like how can something still goes down and causes infection.do we need to get the tooth filled again? our dentist asked us to wait and watch else go for the space maintainers(i m quite reluctant to go to that level). I kind of take it that these "boils" are dental abscesses--kind of like a pimple that forms next to the tooth in question. Most of the time, on baby molars, we do pulpotomies not "root canals". 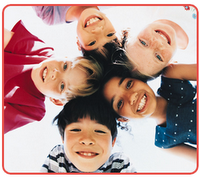 The terms are sometimes confused and often used to mean the same thing in baby teeth. A true root canal, that is often done on dead permanent teeth means all the tissue is removed from the canal and something is there to fill the empty space. Because baby toot root morphology is so variable and strange (like extra canals) true root canals on baby molars are only effective a little over 50% of the time. That is why puloptomies are done on teeth that are still vital (some tissue still alive not dead). I have to say there is about a 90%+ success rate with puloptomies, but it seems that, the ones that don't work out (they abscess or the roots prematurely resorbed) seem to happen on the same kid. In other words some people's immune system seems to not respond well to the procedure, so it's not just one tooth that may have a problem. IRM is just the stuff that fills the space, the real culprit sometimes is the accessory canals or the patients immune response. If a tooth is abscessed, we usually recommend removal and placement of a space maintainer--it's not too big a deal and solves the problem. I will observe some teeth if they are not symptomatic or not getting worse for short periods of time. See my other posts on pulpotimies and space maintainers. I like the idea of using this for a child's baby tooth because it is not practical to be giving children root canals. When used on adults, my only concern is having to make two appointments to fix the same problem. Have you found this to be an issue? Hi Dr. DEAN. MY daughter is almost 3 and had a silver crown put on one of her pre molars i believe and it fell off. She does not have pain but i dont know what to do also i dont know what happend to the silver crown. Do i have to take her back to the dentist? And will it hurt her any time soon? A lot of crowns can be re-cemented, but if you cannot find it, I would call your dentist to see if you can have another one placed. I would not wait too long as sometimes teeth can shift or other problems. Most kids I see are of for a few days or weeks.